Self-Driving Car Quiz -- What Happens When You Spray Paint A Road Sign? An early-model truck bed is filled with empty beer cans and a handful of local community college dropouts. And they’re armed, too… With a can of spray paint. Suddenly, the truck stops at a speed limit sign… One of the degenerates hops out and shakes up the spray can. He single-handedly raised the speed limit by 50 miles per hour. His friends laugh and they drive away without a second though. More on that story in a moment. Self-driving cars are closer to reality than you think. And the technology that will be required for large-scale adoption will be massive. 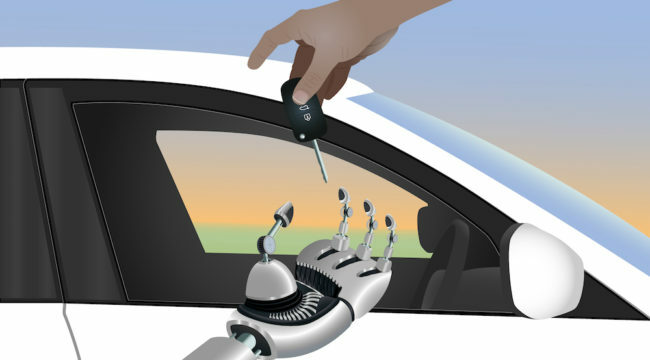 Vehicles will need to interact with everything from other vehicles to road signs to data centers to GPS satellites. All requiring massive amounts of data that will need to be processed faster than the blink of an eye. It is. But believe it or not, the vast majority of the technology needed has already been developed, and these driverless vehicles are already on the road in some parts of the country. Google’s Waymo has already racked up millions of miles driven with their autonomous vehicles, while Ford just recently announced that they’ve partnered with Domino’s Pizza to deliver food via autonomous cars — and they delivered the first pizza last week! Reason #1 Why Data Is So Important: vehicles need to “learn” how to drive. This requires complex procedures that are formulated over millions of miles of test driving. Think of this process as a yes/no flowchart. Reason #2 Why Data Is So Important: Self-driving cars will need to constantly be in communication with the outside world. Between the sensors mapping the surrounding area, GPS information from satellites, and the constant communication with other cars on the road, this technology will require even more data to function properly. However, this massive amount of data transfer will create plenty of opportunities for sabotage. When I say sabotage, I’m referring to all unlawful acts that can hamper the performance of an autonomous vehicle. This could be something as childish as spray painting a speed limit sign, or as advanced as a full-scale hack on the self-driving car’s computer systems. Whatever the case, the technology in these vehicles need to be prepared for any circumstance, which is creating a massive problem for engineers. Technologies Addressing Mischief– Although seemingly childish by nature, the potential dangers of a spray painted road sign or any other type of wrongdoing are very serious. But there is good news. Many technologies are being created to help alleviate these concerns. One of which is from 3M (NYSE:MMM). The company is currently testing invisible “stickers” on road signs that contain bar codes to be scanned by car sensors. These bar codes contain information on things like speed limits, work zones, GPS, and nearby traffic lights, which can then help the car determine its best course of action. Technology Addressing Hackers– This seems to be the more serious problem given the fact that one intruder could potentially take over many vehicles with the same flaw at once. Although the majority of this software is being developed in house by manufacturers, there are some cyber security companies that have thrown their hats into the ring. Cisco, Symantec and DigiCert are a few that are making significant progress protecting these vehicles. Cisco and Symantec are already partnered with some major players in the industry, while DigiCert (a private company that presented at AV17) has the technology to compete with the big dogs, and I expect them to do just that very soon. Stay put for now. I’ll keep you updated on any opportunities that arise in the future.